Hang Man (outside) will try to win a free ticket to the Caulfield Cup via the Mornington Cup. Trainer Mike Moroney hopes Hang Man has a better outcome than stablemate Vengeur Masque in the Mornington Cup. The winner of Saturday’s race gains an automatic start in October’s Caulfield Cup, a race Moroney was hoping to get a start in with Vengeur Masque. But Vengeur Masque failed by a half-head in the 2017 Mornington Cup, forcing Moroney down a different spring path. A lightly raced import, Hang Man is coming off a last-start Flemington win over 2000m. “It’s a strong enough race on Saturday and it’s a big step up in class but he’s in with a light weight,” Moroney said. “His racing manners could make it a little hard around Mornington, but he’s going well, coming off a good, strong win and he came out with the tag of being a mile-and-a-half horse. Saturday’s race has been on Moroney’s radar since Hang Man began his campaign in December, although there were a couple of hiccups along the way. 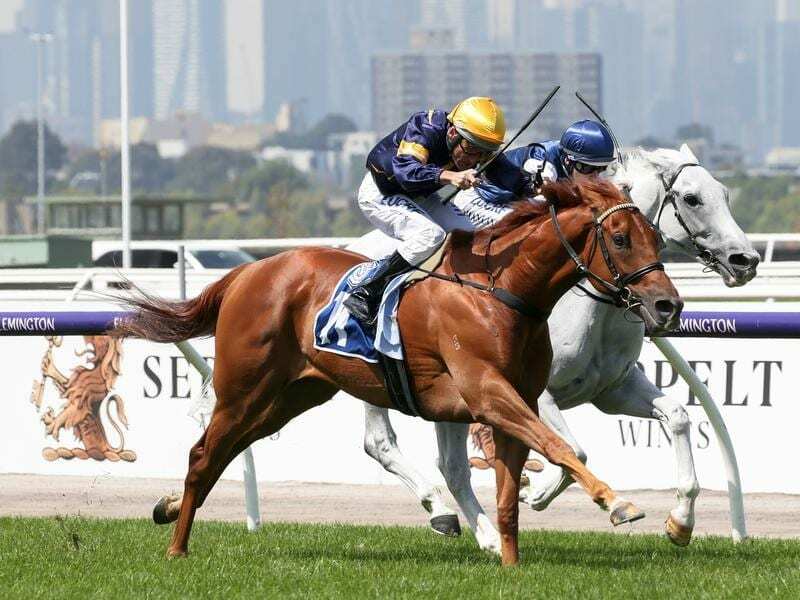 Following a first-up win over 1400m at Caulfield in December, Hang Man was beaten in a five-horse field at Sandown in January before running sixth to Schabau at Flemington before his recent win. Moroney changed Hang Man’s work after the Flemington performance and said he seemed better for it. “We’d like to try and win a ticket into the Caulfield Cup so we aimed at this race when he came back into work,” Moroney said. “He’s had a couple of glitches along the way. He didn’t quite run up to his best at Flemington on one of the days. He also ran second at Sandown in a pretty small field, but otherwise he’s going well. Hang Man continues to garner support for Saturday’s race firming to be the $4.60 second pick with Trap For Fools easing slightly from $2.40 to $2.50 in latest markets.